You are here: Home / LSAT Prep / How Hard is the LSAT? 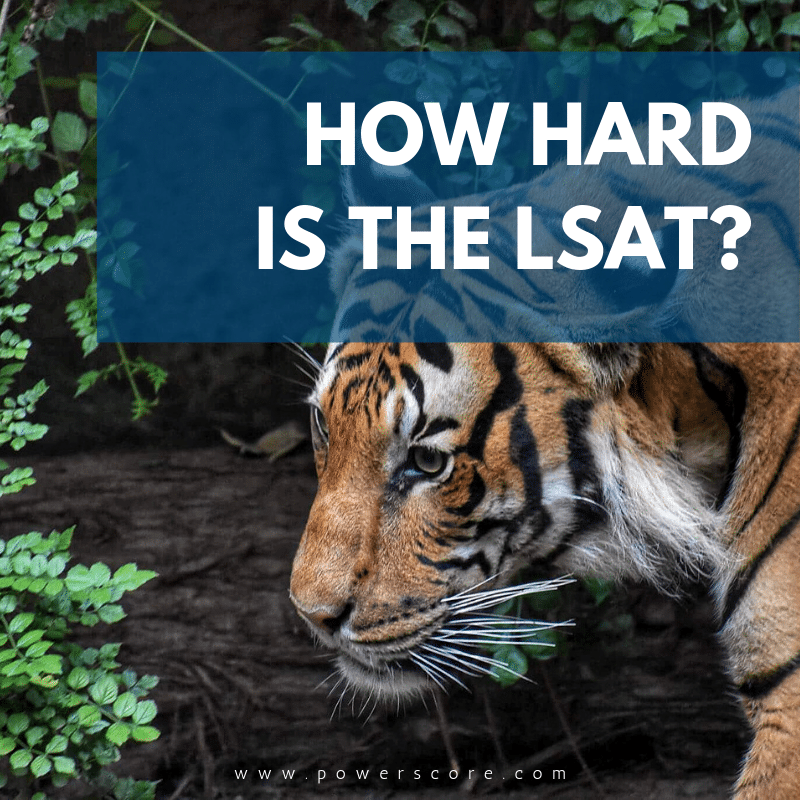 One of the most frequently asked questions we receive is, “How hard is the LSAT?” Most students have heard the test is difficult, but unless they’ve taken an LSAT already, they don’t have a good idea of whether the test really is hard, or whether it’s just like any other college test. Let’s take a look at some numbers and see what the real story is here. First, we have to understand the scores that are produced by the test, because those scores help us measure difficulty. Our LSAT Scoring Scale discussion explains how the 120 to 180 scoring scale works. The key discussion points relate to how many questions you can miss to achieve certain scores, as well as what percentile is represented by each score. Let’s start by looking at the number of people who score a 180, which is a perfect score. In theory, the easier the test, the higher the number of perfect scores. Think about what would happen if you gave a very basic, first grade level spelling test to a group of college-educated adults. For example, a test that included words like “cat” and “dog.” That should be pretty easy (right? ), and you’d expect a large number of perfect scores! On the other hand, if you gave an advanced calculus test to fourth graders, it would be pretty amazing (inhuman, almost) to see even one perfect score. The easier the test relative to the test takers, the more perfect scores you should see. With the LSAT, the percentile for a 180 is 99.97%. Thus, in numerical terms, if you have a 180, then in a room of 10,000 people you have one of the three highest scores. With roughly 100,000 LSATs administered in the past year, that would suggest that about 30 people received a perfect score. When only 30 people achieve this score out of 100,000 test takers, the inference is that this is a very, very difficult exam! Achieving a 180 is also interesting in that to do so does not require perfection. That is, you don’t have to answer all of the questions correctly in order to receive a 180. This page contains a brief overview of scoring scales for the LSATs from June 2005 to the present. It demonstrates that to get a 180, you can, on average, miss around 2 to 3 questions per test. To produce a 3-in-10,000 score, you don’t have to be perfect; you can miss a few questions and still make it happen. Next, let’s focus on a score of 170, which is a highly desirable LSAT score. It’s a score that almost every LSAT taker would be thrilled to receive. A 170 represents a percentile of 97.4%. This means that test takers with a score of 170 have a score higher than 97.4% of all LSAT takers. That’s pretty good! But what does it take to achieve that score? On the September 2018 LSAT, you would have to answer at least 89 of 101 questions to receive a 170. In other words, you can miss 12 questions, and still be above 97.4% of testers. Alternately, you can miss 11.88% of the questions but still be in the top 2.5% of scores. Considered alone, this suggests you have some latitude in missing LSAT questions while still achieving a high score. That by itself is a sign of the difficulty of the test. To bring the point home, let’s compare it to a grading scale you’re probably familiar with: scales used in college. At most colleges, getting 89 out of 100 on a test, means you’d be looking at a B+ or B. That’s certainly a solid grade, but it isn’t one that is considered outstanding or highly desirable. In contrast, getting 89 right on the LSAT results in a score that is considered highly desirable. This too indicates that the LSAT is, in general, a very difficult test. The final piece of evidence regarding test difficulty relates to the guessing policy enforced by LSAC. Unlike many other standardized tests, there is no guessing penalty on the LSAT. In fact, you are strongly encouraged to guess on questions you cannot finish. There’s no penalty for missing a question; if you guess correctly, you receive full credit. Think about that for a second, because what it suggests is that this test is so hard that the test makers don’t even care if you guess; they don’t think it will materially change your score! Their view is that even someone who performs extremely well on the questions they do answer will still not be able to blindly guess their way to a very different score. The conclusion in all of this is that yes indeed, the LSAT is a very hard test. From any objective measure, it’s a challenge to score well on this exam. But there is good news here because in difficulty lies opportunity! The LSAT is a learnable test, and you can improve your performance by studying and preparing properly. Why is that? Because this is a standardized test, and you can learn about the standards and protocols used in the making of the test. The LSAT will always be difficult, but you can improve, and each point you move up takes you above more and more of your fellow test takers. And you don’t have to be anywhere near perfect to do very well. I am thinking about going to university for the first time as an adult student. I have been a stay at home mom for the past 20 years. I have always been interested in law. I am afraid I am setting myself up for disappointed since so much as changed from when I was in Highschool…. especially how everything is done by computers and on line. How realistic is it for me to even consider, with some courses and hard work to write the lsats and pass?? I won’t go to in-depth in it. You have a few things to consider before even thinking about the lsat. But if you’re committed to law school at such an early stage, then you have a heard start then most. There is pre-law and there is philosophy and there is mathematics– all these courses/majors will prepare you for law school. WHen it comes to prepping for the lsat, consider that this site is a prep. resources; powerscore is one of the best published and online resource. If you can afford personal help, One on One is the best, then there is short study, classroom etc.. In the end, its very realistic, its all about how much TIME you put in. And it’s mot a pass fail test, its how high you can score! Hello, I will become a high school junior this fall, and I and very interested on being a lawyer in Michigan. Would you please tell me what kind of activities (certain clubs, volunteer activities, etc.) I can currently do to increase my chances of building my career? 1. Colleges don’t much care what the activity is that you spend time on, they just want to see that you were committed to it. So, that might be playing a musical instrument or being in a political science club or volunteering. 2. Colleges want to see a deep interest in one or two areas, not a wide but shallow set of activities. For example, someone who volunteers a little and is a member of one or two clubs looks like a dabbler. sure, they do many different things, but they don’t go deeply into any one of them. They are a participant, not a leader. Compare that to someone who plays an instrument, is in the school jazz band, plays in put orchestra every term, and who is the VP of music club. That is someone who is showing more commitment to a single area and showing more than just mere participation. Which of those two students is more likely to go on and do something special with their area of interest? that’s right, the one committed to a single area. colleges know that too, and they are looking for difference-makers. Don’t be just a participant, be more deeply involved and make a difference. 3. The key for you is to develop a set of activities that truly interest YOU, because that will make you more likely to participate in them. So, that might be model airplane building or marching band–the activity doesn’t much matter, how deeply you participate in it does. Please let me know if that helps. And good luck! I’m a second year Computer Engineering student from India. 2 years into this course has made me realize that this is just not my field of interest anymore. Seeing my strengths and weaknesses, I made the decision that pursuing a legal profession abroad would be the best challenge for me. (although honestly, it all seems too late since I’m halfway through undergrad school) Could you tell me some tips for international students like me to prepare for the LSAT. And how to continue pursuing my current course(which sees dwindling interest from me) while concentrating on preparing for my legal studies. Thanks for the message! If you have an interest in attending law school here in the US, you really want to focus on two things: maintaining the best grades possible in your current course of study (or any new course of study you might choose) and then to begin preparing for the LSAT in a slow, systematic way. No matter what course of study you take, US law schools will consider you as an applicant. So, you could be a Computer Engineering major, or any major, and you will have a fair shot. they will want to see solid grades in school, however. That’s a start, and your focus should be on raising your GPA and cracking the LSAT. Good luck! I would like to apply to Gonzaga accelerated JD program. My undergrad is from UCLA and i was an average student. But I am older and have a lot of work experience but i know those UCLA transcripts are very important. I need to do VERY well on LSAT and would like to start preparing in November. Thanks for the message! You are right about your transcripts and LSAT both being very important. The LSAT typically outweighs the your GPA by about 2-3 times, but for older students it carries even more weight. But, that’s also a blessing because it means that a high LSAT score can erase an average college performance. Given that you’ve been out of school for a while and that your LSAT score is critical, I’d recommend that you take our LSAT course (https://www.powerscore.com/lsat/courses/), preferably an In Person or Live Online class so you can speak to live instructors and also rely on the regularity of the schedule to get back into study mode after being out of it for so long. If you are starting in November, are you looking at the February or June LSAT? Please let me know your thoughts, as well as any questions you might have. Thanks! I have found your article very interesting and timely as I wish to pursue law in Canada after being self-employed in India as a businessman for the past 10 years. My decision to pursue law as a career comes from an urge to take up a noble profession. I would like to start preparing for LSAT in a couple of weeks. Having applied and positively expecting a Canadian invitation for permanent residency, I would like to know if it is feasible to take up part-time JD (4 years) and gain the competency and employment opportunities of a full-time law graduate. Secondly, I have WES certificates for my bachelor’s in commerce. How would the GPA-LSAT combination work since we aren’t given a GPA in Indian colleges? You’ll need to look at each school that interests you and make a determination there. 2. International GPA Calculation: I can’t be certain how this will be handled. It is likely that CAS will request your transcripts directly from your institution in India. that said, certain Canadian schools require the WES, so it’s good you have that already. Because the policies are so varied, the only way to know is to start the application process and see what the school says. CAS is clear that if the school requires it,they will require your transcripts be sent: https://www.lsac.org/jd/applying-to-law-school/international-transcripts. So, that will depend on the schools you apply to! Thanks for your prompt reply. I will keep you updated about my progress in LSAT. Regarding my question about whether a part-time JD is worth the time, I found an article: http://www.admissionsconsultants.com/lawschool/part_time_programs.asphighlighting the pros and cons. Do you agree that graduating from a part-time law school affects employment options? Maybe a workaround could be interning/taking up a clerical job at a lawyer’s office to gain the much needed experience. Personally, if someone is applying with a part-time degree and they worked during the day, I’m impressed–they had to work hard for that degree and really want it. Another big issue is that not all schools offer part time programs (as we’ve discussed), and so even if we had data it would be skewed. I’m currently an undergraduate in Communications and Leadership Development and I’ve been recently looking into becoming a Lawyer. Your article gave me a lot of information that I was looking for but I’m still worried about not actually being in Pre law. Would that put me at a disadvantage if I were to actually get into law school? Also does the major I’m in currently matter if I wanted to become a lawyer specializing more specifically in Entertainment Law? Thanks for the question! You are NO disadvantage at all by not being prelaw. While your major does play a role, students who come in from “traditional” prelaw majors like Political science are actually at a slight disadvantage when compared to less common majors such as science. the reason is that law schools want diversity in every area, majors included. So, if all else is equal, they are more likely to take a 2nd biomedical engineering major over their 75th political science major. Does that make sense? The short answer is that you don’t need a particular major, and the less common your major is, the better. and the law you want to practice won’t matter unless you already have experience there (such as with IP Law). Hey Dave! I loved your article. I’ve been considering taking the LSAT and going to law school for some time now and I wanted to know your thoughts on my current major. I’m currently double majoring in Philosophy and Political Science. I noticed that one of your previous answers expressed concern for the PS major saying it places students with that major at a disadvantage. Does having the philosophy major level out the disadvantage? Does the philosophy major put me at an advantage with the LSAT? Thanks for the question! Just to be clear, there’s no issue at all with a policsci major; you aren’t hurt or disadvantaged by it! My point was that less common majors provide a very small bump in comparison. So, you aren’t hurt by the polisci major, nor helped by it. Philosophy is also a relatively common (or at least common enough not to be notable), and it won’t by itself be an advantage (although the double-major is a small boost). Philosophy is also another humanities major, and doubles in the humanities aren’t rare. The majors that “help” tend to be on the science side, since there are fewer of those. So, you should be able to hit the ground running with the LSAT, and given how important this test is to applications, that’s a sizable advantage (note: you’ll have to make some adjustments for the format of the LSAT, but in my experience most philosophy majors are able to successfully make that switch). This is diksha here. I am currently a year 11 student studying in Auckland, New Zealand. when I finish high school I wanted to challenge myself and chose a profession that intrusts me, and I chose to become a lawyer. I am a little scared and nervous about studying law as a undergraduate student, I would like some advice on the surroundings of becoming a professional lawyer. I have read your pervious replies and researched about the lawyer careers but they didn’t help much. I want to know now so that i can prepare myself for what type of career i want to get into. For now, you shouldn’t be scared about studying law. Your goal should be to enjoy the classes and do as well as possible in them. that will set you up for a career better than anything else at this point. It’s also the case that studying the law abroad vs studying in the US or Canada are two different experiences. In the US, students don’t study law until after graduating from university, whereas you have the option of studying while in uni. For the practice of NZ law, I don’t have much experience there, but you could turn to places like Reddit for insight. For example, this thread might help you: https://www.reddit.com/r/newzealand/comments/49fk3s/what_is_it_like_bein…. You are already doing the best thing you can: thinking about your choices beforehand. If you work hard and put the same type of care into your studies, you’ll be successful no matter what. I’m also a bit older and interested in returning to school to study law in Canada. I first went to university almost 10 years ago. Since then, I’ve done some community college courses (I left my program because I got hired in my field) and most recently have earned a few university credits (as part of a certificate that I’m still working on part-time). My first time at university, I did terribly! I was dealing with some health issues so have a couple mediocre grades and a couple failed credits. During my more recent time in academia I got great grades, though. Can high a LSAT score help me recover from my early poor academic performance? I’m worried that my non-linear path will make me look like a dabbler. How do I make sure I am taken seriously in my application? the key for you will be to post as high as an LSAT score as possible, and then to write an addendum explaining what happened with your grades (and your story is a common one, so they will understand it). As for the “dabbler” part, that depends on how your career path went, and how well the pieces relate to each other. there’s nothing wrong with dabbling per se, as long as it’s clear that your commitment to law is strong, which could be done through your personal statement and Letters of Rec (LORs). your comment section looks cheesy and hand-selected. I graduated this past June with my BA in Political Science; minor in Islamic World Studies. I left school a little unsure of my next step, but I have decided kind of late that applying to law school is a chance that I am willing to take. I have not taken my LSATs yet but plan to in the near future. November is fast approaching and I assume so are the application deadlines for most schools. Is this year lost for me in terms of applying to schools to attend next Fall? So, you are fine for January, and in many cases, later as well! Hi Dave, I’m a 51 year old and I’m seriously considering law school. I have my BS in Legal Studies and I’m looking into enrolling in a part-time program. How much time should I expect to devote to studies, especially during the 1st year? I will have to work to maintain a living. Thanks for the message! It varies from person to person, but the workload is not insignificant. Classes are usually at least from around 6 PM to 8 PM each night (Mon – Thu/Fri), with some nights going longer. Outside of class you will be looking at least 1.5-3 hours of homework for each class hour, so about 12-30 additional hours, depending on the program specifics. So, a LOT of work! The good news: you can keep your current job in a part-time program; that’s what they are designed for! This article was very thoughtful of you and the comments inspiring. My goal is to attend LAw School after getting my B.A in Psychology in two more years. I am an International student and my first language is French which means that I had to learn English in my first two years in the U.S. I am a driven person, and I love a challenge. I am always pushing myself to the next level. I am thinking about taking the LSAT by the end of this year (2019), and i’d love to have your advice on how do you think a international student can do in this exam. 1. The language barrier. This can be tough since the LSAT demands a strong English language facility. Their questions often depend on nuance and interpretation, which can be tough for English second language speakers. however, you’ve clearly worked hard already, and so if you continue on, this bis something you will get better at. Your focus has to be on learning the language of the LSAT, in particular. 2. The standardized test unfamiliarity. Most international students are used to essay test and so the multiple-choice format of the LSAT can be uncomfortable. It takes time to overcome this, but you can get past it! It’s all about hard work and familiarity, so I would recommend starting your prep sooner rather than later. Read up on the test, do as many practice tests as possible, and work steadily. You can get there! Thanks for the message! The first place to start is with your degree. Law schools typically require a full 4-year degree to enter, and so you may need two more years of college in order to gain entrance to law school. After that, focus on your LSAT score. your grades and GPA are the two biggest factors in where you get in!